محور دهج- میدوک در شمال شهر بابک جای دارد. در این منطقه، در مجموع 9 توده پورفیری نیمه‌ژرف شامل میدوک، پرکام، ایجو، سقینو، چاه‌فیروزه، نرکوه، ایوب انصار، سرا و کدر با سن الیگوسن تا پلیوسن دیده می‌شود که از میان آنها توده‌های پرکام، ایجو، سقینو، چاه‌فیروزه و میدوک باردار و توده‌های نرکوه، ایوب انصار، سرا و کدر نابارور هستند. ترکیب این توده‌ها بیشتر شامل دیوریت پورفیری، کوارتزدیوریت و گرانودیوریت است. بر پایه مطالعات ژئوشیمیایی مشخص شد که ماگمای مجموعه مورد بررسی، سرشت پرآلومین تا متاآلومین دارد و سری ماگمایی آن از نوع کالک‌آلکالن پتاسیم بالا و شوشونیتی است. همچنین بررسی نمودارهای تغییرات اکسیدهای اصلی و عناصر فرعی، طیف پیوسته‌ای میان ترکیبات سنگ‌های مورد مطالعه نشان می‌دهد که نشان‌دهنده انجام تفریق ماگمایی گسترده در طی تبلور است. شواهد صحرایی و ژئوشیمیایی نشان می‌دهد که فعالیت ماگمایی محور دهج- میدوک از نوع I است. همه داده‌ها نشان می‌دهند که سنگ‌های مورد مطالعه، حاصل فرورانش پوسته اقیانوسی نوتتیس به زیر پوسته قاره‌ای ایران مرکزی هستند. در بخش‌هایی از منطقه مورد مطالعه، فرورانش تخت رخ داده و به همین سبب، نرخ ذوب بخشی نیز پایین است و در نتیجه سنگ‌های آداکیتی تشکیل شده‌اند. این سنگ‌های آداکیتی، توده‌های نفوذی زمان پلیوسن را تشکیل داده‌اند و به سبب اینکه ماگما در مراحل پیشین فعالیت ماگمایی و در طی تشکیل توده‌های باردار، عناصر فلزی خود را از دست می‌دهد، کانه‌زایی ندارد و نابارور است. Dehaj-Meiduk area is located at North of Shahre-babak. There are nine porphyry intrusive bodies in this region, which include Meiduk, Parkam, Iejoo, Segino, Chah Firouzeh, Narkoh, Ayoub Ansar, Sara and Keder. Meiduk, Chah Firouzeh, Parkam, Iejoo and Segino are productive among them and Narkoh, Keder, Ayoub Ansar and Sara are barren. These intrusive bodies are mostly composed of porphyry diorite, quartzdiorite and granodiorite. Geochemical studies indicate that the magma of these rocks has the peraluminous to metaluminous nature and magma series are calc-alkaline with high potassium and shoshsonitic nature. The geochemical variation diagrams of major oxides and minor elements, illustrate the continuous spectrum of rock compositions for the studied samples, which indicates high crystallization differentiation during magmatic processes. Field observations, petrographic and geochemical studies suggest that the rocks in the Dehaj-Meiduk area are I type. All available data demonstrate that these rocks are result of subduction of Neotethyan oceanic crust beneath the central Iran continental crust. Flat subduction happened in some parts of the study area and because of that, partial melting rate has been low and as a result adakitic rocks are produced. The adakitic rocks have formed intrusive bodies in Pliocene. Since magma is depleted in metallic elements by forming earlier stage productive plutons, the later rocks do not contain metallic elements and are barren. احمدی پورفرسنگی، ح.، 1372- بررسی دینامیزم فعالیت­های آتشفشانی کوه مزاحیم (شهربابک)، پایان‌نامه کارشناسی ارشد، دانشگاه شهید باهنر کرمان. اسدی­پور، ع.، 1381- پتروگرافی، ژئوشیمی و پترولوژی توده­ها و زیر ولکانیک کالدرای استراتوولکان مزاحیم، شرکت ملی صنایع مس ایران، شماره گزارش، 146 ص. برهمند، ل.، رسولی، ج. و قربانی، م.، 1395- دما و فشارسنجی و ژئوشیمی توده­های باردار و عقیم در محور دهج- میدوک با استفاده از شیمی بیوتیت (شمال شهربابک)، پذیرش برای چاپ در مجله بلورشناسی و کانی شناسی ایران. 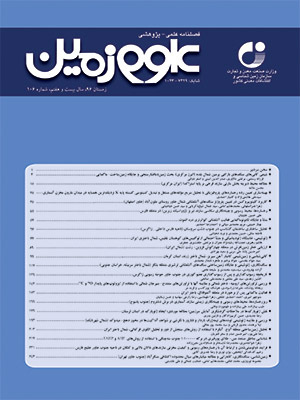 بیابانگرد ،ع.، 1378- پتروگرافی و پترولوژی سنگ­های نیمه آتشفشانی شهربابک - جوزم، پایان‌نامه کارشناسی ارشد، دانشکده علوم زمین، دانشگاه شهید باهنر کرمان. پروین­پور، ف.، 1386- مطالعات زمین­شناسی اقتصادی کانسارهای مس پورفیری زیر زون آبدر- دهج (شمال غرب کرمان)، پایان‌نامه کارشناسی ارشد، دانشگاه آزاد اسلامی واحد علوم و تحقیقات. رسولی، ج.، قربانی، م. و احدنژاد، و.، 1394- سنگ­شناسی توده­های نفوذی کمپلکس گرانیتوئیدی جبال بارز (خاور و جنوب ‌خاور جیرفت)، فصلنامه علوم زمین، شماره 96، صص. 3 تا 16. عطاپور، ح. و آفتابی، ع.، 1388- ژئوشیمی و متالوژنی سنگ­های کلسیمی- قلیایی، شوشونیتی و آداکیتی در ارتباط با کانسار سازی مس مولیبدن و رگه­ای در کمربند آتشفشانی دهج- ساردوییه، کرمان، فصلنامه علوم زمین، شماره 72، صص. 161 تا 172. عطاپور، ح.، 1386- تکوین ژئوشیمیایی و متالوژنی سنگ­های آذرین پتاسیم­دار در کمربند آتشفشانی نفوذی دهج-ساردوییه استان کرمان با نگرش ویژه به عناصر خاص، رساله دکترای زمین‌شناسی اقتصادی، دانشگاه شهید باهنر کرمان، 401 ص. قربانی، م.­، 1386- زمین‌شناسی اقتصادی و ذخایر معدنی و طبیعی ایران، انتشارات آرین زمین ، 464 ص. قربانی، م.، 1387- ارزیابی پتانسیل­های مس پورفیری در زیر زون آبدر­- دهج به مرکزیت میدوک . شرکت ملی صنایع مس ایران، شماره گزارش: 273 ص. قزوینی، ا.، 1371- بررسی زمین­شناسی اقتصادی کانسار مس میدوک، پایان‌نامه کارشناسی ارشد، دانشکده علوم زمین، دانشگاه شهید بهشتی. مرادیان شهربابکی، ع.، 1369- بررسی پترولوژی و ارزیابی اقتصادی سنگ­های فلدسپاتویید­دار شهربابک- جوزم، پایان­نامه کارشناسی ارشد، دانشگاه تهران. Aghazadeh, M., Hou, Z., Badrzadeh, Z and Zhou, L., 2015- Temporal–spatial distribution and tectonic setting of porphyry copper deposits in Iran: Constraints from zircon U–Pb and molybdenite Re–Os geochronology, Ore Geology Reviews 70, (3):385–406. Amidi, S. M., 1977- otude géologique de la région de Natanz-Surk (Iran, Cen-tral), Thèse Ph.D., Univ. Grénoble, France, 316p. Barker, D. S., 1983- Igneous rocks: Prentice, Hall. 417p. Batchelor, R. A and Bowden, P., 1985- Petrogenetic interpretation of granitoid rocks series using multicationic parameters. Chemical Geology, 48(2): 43-55. Berberian, F. and Berberian, M., 1981- Tectono- plutonic episodes in Iran. Geological Survey of Iran, Rep. No.52, 565-592. Berberian, M. and King, G. C. P., 1981- Towards a Paleogeography and tectonic evolution of Iran. Canadian Journal of Earth Science, 18, 210-265. Berberian, F., Muir, I. D., Pankhurst, R. J. and Berberian, M., 1982- Late Cretaceous and Early Miocene Andean-type plutonic activity in northern Makran and Central Iran: Journal of the Geological Society of London, 139, 605-614. Biju-Duval, B., Dercourt, J. and Le Pichon, Y., 1977- From the Tethys Ocean to the Mediterranean seas: Editions Technique Paris, pp. 143-164. Boccalettie, M., et al, 1977, Neogene and Quaternary volcanism of the Bigar area (western Iran): Bulletin of Volcanology, 40(2): 1-12. Chappell, K. and Millward, M., 2000- Copper exploration in Kerman area central Iran, East Azarbaijan, NW Iran, National Geoscience Database of Iran, Tehran, Iran, 22p. Defant, M. J. and Drummond, M. S., 1990- Derivation of some modern arc magmas by melting of young subducted lithosphere, Nature, 34(4): 662-665. Dimitrijevic, M. D., 1973- Geology of Kerman region, Geological Survey of Iran, 334p. Emami, M. H., 1981- Géologie de la région de Qom-Aran (Iran): Contribu-tion a l'étude dynamique et géochimique du volcanisme Tertiaire de l'I-ran Central: Ph. D.,Thèse, Univ., Grenoble, France, 489p. Etminan, E., 1977- Le porphyre cuprifere de Sarcheshmeh (Iran): Role des phases fluides dans les mechanismes d'alteration et demineralization GSI, Rept. No. 48. 249pp. Ewart, A., 1979- A review of the mineralogy and chemistry of Tertiary-Recent dacitic, latitic, rhyolitic and related salic volcanic rocks. In: F. Barker (Editor), Trondhjemites, dacites, and related rocks. Springer, Berlin, 423-492. Forster, H., Fesefeldt, K., Kursten, M. and Germany, F. R., 1972- Magmatic and orogenic evolution of central Iranian volcanic belt, 24th Geological Conference, Geological Survey of Iran, Section 2 , 198-210. Gutscher, M. A., 2002- Andean subduction styles and their effect on thermal structure and intraplate coupling, Journal of South American Earth Sciences, 15(2): 3-10. Harker, A., 1909- The natural history of igneous rocks, Methneu Publication, London, 344p. Haschke, M. R., Scheuber, E., Gunther, A. and Reutter, K. J., 2002- Evolutionary cycles during the Andean orogery: repeated slab break off and flat subduction? Terra nova,14, 49-55. Hassanzadeh, J., 1993- Metallogenic and tectonomagmatic events in the SE sector of the Cenozoic active continental margin of Central Iran, Shahr-e-Babak area, Kerman province, Ph.D. Thesis, Univ. California, 204p. Jung, A., Kursten, M. and Tarkian, M., 1975- Post Mesozoic volcanism in Iran and its relation to the subduction of the Afro-Arabian under Eurasian plate: Afar Monograph, 41-54 p.
Katie, A., Chackc, T., Simonetti, A., Zachary, D. and Larry, M., 2014- A Record of Paleoproterozoic Subduction Preserved in the Northern Slave CratonicMantle: Sr-Pb-O Isotope and Trace-element Investigations of Eclogite Xenoliths from the Jericho and Muskox Kimberlites. Journal of Petrology, 55(3): 549-583. doi:10.1093/petrology/egt077. Maniar, P. D. and Piccoli, M., 1989- Tectonic discrimination of granitoids. Geology Society American Bull, 101(2): 635-633. Moine-Vaziri, H., Khalili-Marandi, Sh. and Brousse, R., 1991- L'importance d'un volcanisme potassique, au Miocene supérieur en Azaerbaijan (Iran): C.R. Acad. Sci. Paris, T. 313, Serie II, 1603-1610. Moores, E. M. and Twiss, R. J., 1995- Tectonics: Freeman and Company, New York, 415pp. Muller, D. and Groves, A., 1997- Potassic igneous rocks and associated gold-copper mineralization, Springer Verlag, 238p. Peccarillo, A. and Taylor, S. R., 1976- Geochemistry of the Eocene calc-alkaline volcanic rocks from the Kastamonu area northern Turkey. Contributions to Mineralogy and Petrology, 58(1): 63-81. Rasouli, J., Ghorbani, M., Ahadnejad, V. and Poli, G., 2016- Calk-alkaline magmatism of Jebal-e-Barez plutonic complex, SE Iran: Implication for subduction-related magmatic arc, Arabian Journal of Geosciences, (2016) 9:287, DOI 10.1007/s12517-015-2124-9. Shand, S. J., 1943- Eruptive Rocks, Their Genesis, Composition, Classification, and Their Relation to Ore-Deposits. John Wiley & Sons, New York, 444 pp. Thorpe, R. S., 1982- Andesites: orogenic andesites and related rocks: John Wiley and Sons, 724 pp. Ulmer, P., 2001- Partial melting in the mantle wedge- the role H2O in the genesis of mantle-derived arc-related magmas: Physics of the Earth and Planetary Interior, 127(3): 215-232. Wang, Q., Xu, J. F., Jian, P., Bao, Z., Zhad, Z., Li, C., Xiong, X. and Ma, J., 2006- Petrogenesis of adakitic porphyries in an extensional tectonic setting, Dexing, south China: Implications for the genesis of porphyry copper mineralization, Journal of Petrology, 47(1): 119-144. Wilson, M., 1989- Igneous petrogenesis a global tectonic appproach, London (Unwin Hyman), 466pp.